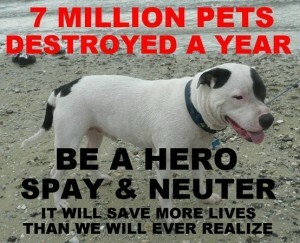 Why don’t we spay or neuter our pets ?..Is it because we feel bad to do such a act to our beloved pets. Is the pet the only pet in the family therefore you feel you don’t need to do so…Is it our ego ? There is a big question there. ..Do we want to breed your pet..Hoping to get another one just like our existing pet..Is it because we can not afford it..Going to the veterinarian can be intimidating. Another factor can be that you do not have the money to have your pet spayed or neutered.. It can be quite costly. Additionally, many veterinarians insist on the pet being updated with all of their shot. Have a medical clearance for the procedure to be done..Blood work and other tests. You will need a small loan. There is no doubt that we need to spay and neuter our pets..Just visit a shelter and you will see why. So knowing we need too, why don’t most pet owners do so? I believe that most situations are simply a financal one. I know in New Jersey there are many municipal and state funded discounted spay and neuter programs out there..I have assisted many pet owners with these types of programs in Cape May County. In a lot of these cases they will pay for shots and more. First decide that it is important to spay and neuter..Second how can we accomplish this even when we do not have monies to do so. Call your local municipality. Call local veterinaran’s offices, they are familiar with the programs that are out there. In some cases elderly and disabled individuals can get help if they are one certain programs..Again what if you are not on these programs and need help. You might be temporally in a bad financial way. The point is help can be found. If you hit a dead end or need assistance you can leave your questions and email address. We can help you find the right direction to go to. Everyone loves their pets and there are systems in place that can help you and your pet live happy lives together..God Bless all of those who love animals and pray for those who no not yet. Be apart of a movement to have no pets put down from over population. If we all stick together we can make a difference one pet at a time. This entry was posted in Pet News and tagged Cape Mays Best Pet Friendly News Blog Spay Neuter Programs by admin. Bookmark the permalink.